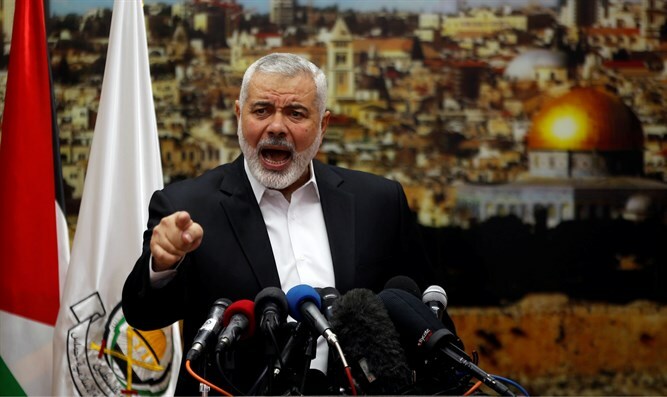 Hamas leadership stresses its determination to prevent Israel from exercising military freedom. Hamas’ political bureau on Wednesday evening released the document summarizing the four-day meeting it held in Gaza. The meeting marked the first time that the entire membership of the Hamas political bureau convened, including its representatives abroad. At the same time, Hamas announced that it would be ready for indirect negotiations on a prisoner exchange deal with Israel. Reports last week indicated that a deal between Israel and Hamas would involve a long-term cessation of hostilities in exchange for a significant easing of the Jewish state’s economic blockade of Gaza. An agreement could allow international donors to fund a series of programs including electricity and water network upgrades in Gaza. It could also cover a prisoner exchange with Hamas which holds the bodies of Hadar Goldin and Oron Shaul, two soldiers killed in 2014 during the counterterrorism Operation Protective Edge. On Tuesday, a senior Hamas official said in an interview with the Turkish news agency Anadolu that an agreement would be reached by the end of the month. Pakistani Defense Minister threatens to nuke Israel Pakistan threatens Israel with nukes after fake news report.